Located in the Mysore plateau of Southern India, Bangalore is a city of many tales. I recently traveled from Chennai to Bangalore for a short trip. Beginning with the construction of a small mud fort by a feudal lord in 1537, Bangalore has today grown to become a major urban center with numerous multinational IT companies having their headquarters in the city. Popularly referred to as India’s Silicon Valley, it is also known to be the garden city given the large parks located in the heart of this busy metropolis. I have put together 5 places you must visit when in Bangalore. Lalbaug, literally translated as the Red Park is a botanical garden commissioned in 1760 by Hyder Ali, the ruler of Mysore state. Over the centuries, the garden has grown in size which today stands at 188 acres. 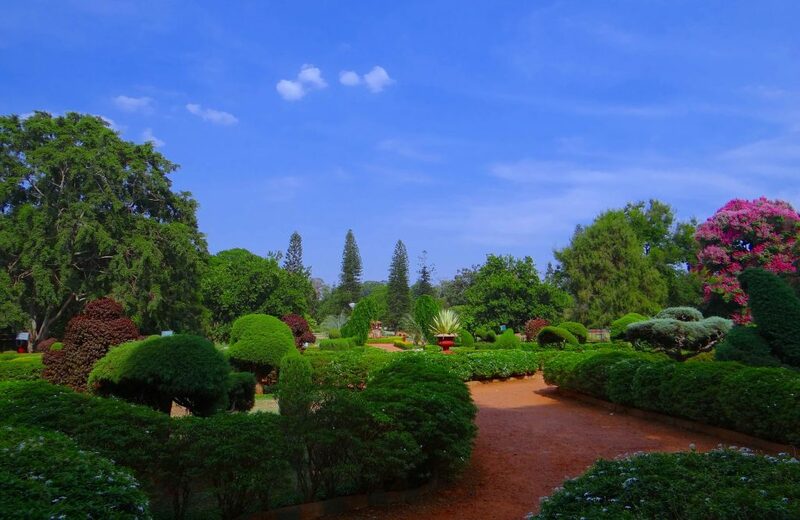 Several species of plants and trees are to be found within it making Lalbagh one of the largest collection of rare tropical plants in the subcontinent. It also houses a lake making it a popular spot for birding. Commonly sighted birds include spotted kite, Indian Cormorant, kingfisher, egret, heron and parakeets. Lalbaug is most popular for its glass house built in 1889 where flower shows are held twice every year. Another large park in Bangalore is Cubbon park formed in 1870. T covers an area of around 100 acres and is rich with diverse flora and fauna. It is home to few snake species and is frequented by naturalists who wish to study the park’s wildlife. It also houses historical buildings like the state central library and statues like those of Queen Victoria and Sir K.Sheshadri Iyer. It has many paths laid out for walkers making it a popular attraction among the city-dwellers. It is famous for being a landmark lung area of the city. Located at around 60 kms off the city of Bangalore close to the town of Nandi are the Nandi hills. The state horticulture department has made a garden for tourists and the spot is a popular tourist attraction during the summer months. It is a very well-liked spot by bicyclists who frequent this place during weekends. At an altitude of 400 meters, it serves as a training place for hill cycling. The Nandi hills are also famous for being a popular spot for paragliding activity. Bangalore has long been famous for being a spiritual retreat for those seeking peace and solitude. The many ashrams located in its green peripheral environs have made it an attraction for people world over. The Pyramid Valley is one such retreat built solely for meditation. Founded in 2003, it is the largest meditation pyramid in the world. Located around 20 km off Bangalore in the district of Ramnagar, it is a quiet and peaceful area far away from the hustle and bustle of the city thus making it a perfect place for one to get in tune with nature and with oneself. A huge statue of Buddha can be found in its premises of this center. Bangalore has a gold mine for the bibliophile in you. Located at Church Street, Blossoms houses over 20,000 second-hand books divided into different sections ranging from contemporary and classical literature, children’s literature, comics, arts and craft and many more. For a true bookworm, a trip to Bangalore is incomplete without making a visit to Blossoms. I cherished the well-worn copy of Gerald Durrells’ My Family and Other Animals that I picked up. These were my favourite places to travel in and around Bangalore. With several flights to Bangalore, you can visit the ‘Garden City’ for an exciting trip. Have you visited Bangalore before? Which is your favorite place to visit in the city? I’m sure people going to Bangalore will appreciate these tips. Sometimes you can miss important points when traveling. If all of the places look like or similar to the image above I want to move there! lol I am so done with winter already and its really just beginning here..
That park is so gorgeous. I’d love to take a book and blanket and spend hours there!